On Friday, the Sacramento Bee's Dan Walters chided the California Republican Party for opposition to all tax increases, even those that would close a "completely unjustified special interest tax loophole." We’re not sure what Dan had in mind, but we’re certain that it is not the tax policy -- known as elective sales factor -- that ensures all California employers are imposed a fair tax and can successfully maintain employment and operations in California. The competitive tax policy that passed in 2009 with a substantial majority in both houses was subsequently supported by voters with the failure of proposition 24. This policy is threatened again in AB 1500. 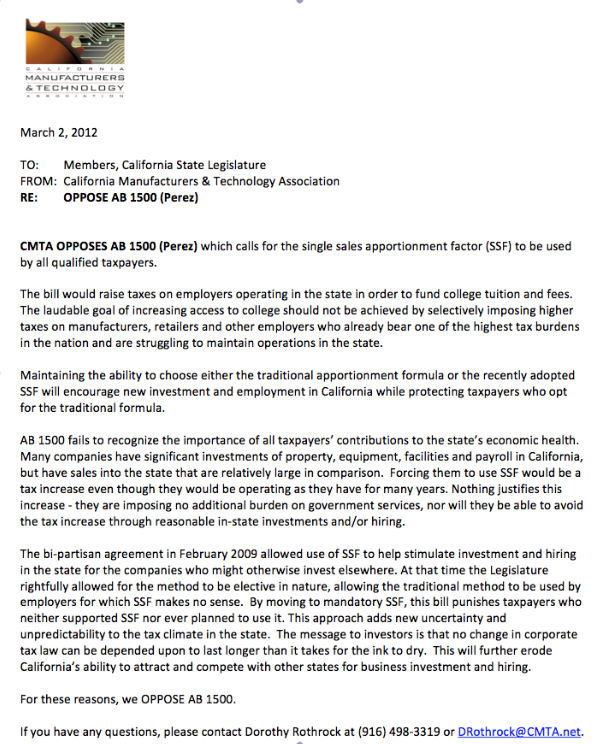 Our letter opposing AB 1500 describes why this particular tax increase is, without question, bad public policy and should be defeated again.